Small cutouts of the Flexible Thermal Protection System for NASA’s Hypersonic Inflatable Aerodynamic Decelerator, or HIAD, were exposed to temperatures up to approximately 2,700 F during testing at Boeing’s Large Core Arc Tunnel in St. Louis, Mo. NASA heat shield material that could one day be used on an inflatable aeroshell during atmospheric entry on Mars recently underwent testing at Boeing’s Large Core Arc Tunnel in St. Louis, Mo. The inflatable aeroshell, using high temperature advanced flexible material systems, will enable atmospheric entry to planetary bodies and the landing of heavy payloads. The Hypersonic Inflatable Aerodynamic Decelerator project is focused on development of the inflatable aeroshell technology and manufacturing capability at large scale, to support an orbital atmospheric entry flight experiment at Earth and Mars. HIAD overcomes size and weight limitations of current rigid systems by utilizing inflatable soft-goods materials that can be packed into a small volume and deployed to form a large aeroshell before atmospheric entry. 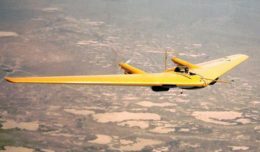 Critical to the development of the technology is development of flexible material systems whose performance must be verified through arc jet testing. During early August testing, small cutouts of the Flexible Thermal Protection System (F-TPS), about 2.5 inches in diameter and anywhere from a half-inch to 1 inch thick, were placed in a supersonic wind tunnel and blasted with jets of superheated plasma gas. 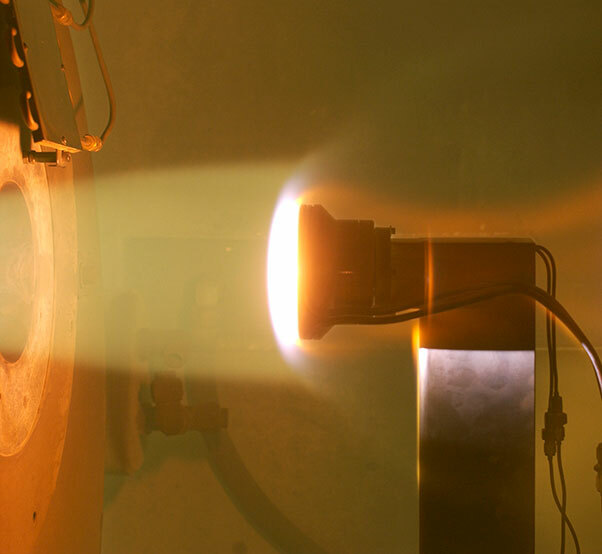 The plasma gas hit the cutouts at speeds of Mach 4 or more, and heated the surfaces to temperatures up to approximately 2,700 F. Thermocouples embedded in the samples measured the material’s response to the superheated conditions. 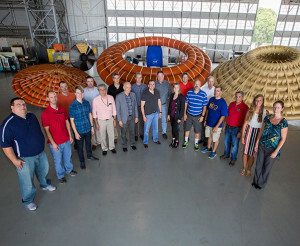 Members of NASA Langley’s HIAD team are seen here with models of the inflatable aeroshell, which will enable atmospheric entry to planetary bodies and the landing of heavy payloads. Researchers calibrated tunnel pressure and temperature to be similar to the range of conditions HIADs would face during atmospheric entry on Earth and Mars. The data from these tests will be used to validate mathematical models used for design. The test team included researchers Steven Tobin, Matt Wells and Andrew Brune of NASA’s Langley Research Center in Hampton, Va.; and Grant Rossman, a Ph.D. candidate at the Georgia Institute of Technology in Atlanta. HIAD technology is being developed by researchers at Langley through NASA’s Game Changing Development program, which is part of the agency’s Space Technology Mission Directorate. The program advances space technologies that may lead to entirely new approaches to space missions. For more information about GCD, visit http://gameon.nasa.gov.